For America, a conservative activist group, has produced a video challenging Senate Republican leader Mitch McConnell (R-KY) and House Speaker John Boehner (R-OH) not to be “chicken,” and to support the group’s “Cut, Cap, and Balance” pledge – cut the deficit, cap spending, and balance the budget. The video is being sent 1.5 million people via e-mail. It has some farm humor and notes that "chickens tend to flock together, often following each other without a real sense of direction." The video comes on the heels of House Majority Leader Eric Cantor (R-Va.) – Boehner’s representative in negotiations to raise the debt ceiling – walking out of debt-limit/budget talks on Thursday after Democrats insisted on tax increases as part of any deal. “Regardless of the progress that has been made, the tax issue must be resolved before discussions can continue,” Cantor said in a statement. ForAmerica is headed by Brent Bozell, the president of the Media Research Center. All we can add is Go Brent & Go America. As of this post, they already has over 1.2 million Likes / Followers their FaceBook Fan Page: ForAmerica. See you at the Pledge! Tags: Don't Be A Chicken, Cut, Cap, Balance, budget, debt ceiling, video To share or post to your site, click on "Post Link". Please mention / link to America's Best Choice. Thanks! Posted by Bill Smith : Post Link --> 1:16 PM 0 Comments - Share Yours! Additional article: By Susan Cockink, The Miami Herald, Deerfield Beach: The shipwreck of the Ancient Mariner, about 60 feet deep off Deerfield Beach, received a patriotic decoration Sunday courtesy of U.S. Rep. Allen West, R-Plantation, and about a dozen military veterans. 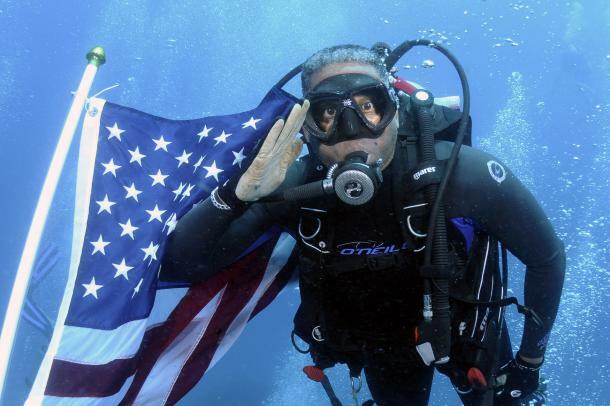 West and his dive companions briefly put up an American flag on the deck of the popular artificial reef, then posed for photos and videos, as several dozen civilian divers — and numerous fish — watched. The flag flapped proudly in the strong southerly current. The ceremony was part of June’s “Learn to Dive” month established by the Greater Fort Lauderdale Convention and Visitors Bureau to encourage locals and tourists to take up scuba diving. It was also an opportunity for military veterans — both newly-certified and experienced divers — to have fun underwater. Tags: Allen West, US Representative, veterans, Diveheart, Greater Ft. Lauderdale, flaf, diving, To share or post to your site, click on "Post Link". Please mention / link to America's Best Choice. Thanks! Posted by Bill Smith : Post Link --> 7:59 PM 0 Comments - Share Yours! Bill Smith, Editor, ARRA News Service: In the "yesteryears" we used the term "the domino effect"to illustrate the spreading of communism. 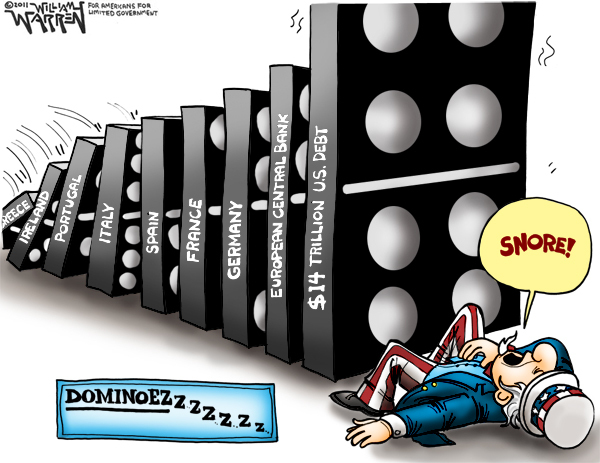 Cartoonist William Warren has now used dominoes in his latest political cartoon (below) to depict the coming collapse of the American economy. Is there anyone "who cares" at the White House or in the Senate Democrat leadership and is also willing to stop or to help mitigate the coming economic collapse of America? Mr. Obama, we do not need anymore campaign rhetoric! The progressive liberals and even a few anarchist from odd political variations may be looking favorably toward the collapse of our country, but the rest of America is not. Many House Republican have demonstrated their concern. They came to Washington with a clear understanding that they have no promise of returning for another term. They also understand that time is running out for certain problems to be resolved. They know they might be "out on the street" with their follow Americans if the economy collapses. Also, rumors are spreading of fear of a potential dictatorship operating out of the White House in the future if an economic collapse were to occur. Cap spending so it aligns with average revenues (ratcheting quickly down to 18% of GDP from current 24%). Send a strong Balanced Budget Amendment to the states for ratification (with high hurdle for tax hikes and 18% of GDP spending cap). Today, The Washington Times in an editorial said, “the debt ceiling represents the last chance conservatives have” to cut spending and prevent this most predictable crisis. The Republican Study Committee Chairman, Rep. Jim Jordan (R-OH), also said today "The United States of America, the most dynamic country in history, is running headlong into a major debt crisis. Prominent Democrat Erskine Bowles calls it "the most predictable economic crisis in history." And with Washington borrowing more than 40 cents out of every dollar spent, we are rapidly approaching a tipping point. 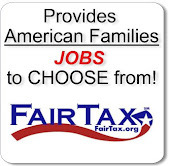 While President Obama asked Congress for a blank check debt limit increase (which the House voted down 97-318), conservatives are getting behind a plan that could actually prevent the coming calamity." 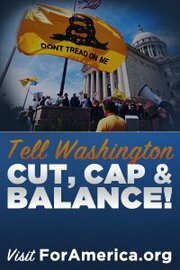 Yesterday, the House grassroots Republicans released their; “Cut, Cap, and Balance” proposal which is supported by numerous conservative organizations. Where are the democrats and other republicans? Forget the tabloid journalism over Rep. Anthony Weiner (D-NY). The crisis looming over America is far more important and yes "bigger" (pun intended) than the anatomy and behavior issues of the misguided Rep. Weiner. It is shameful that elected members of Congress, the "lame street" news, and the cable channels, including Fox News, are wasting time and effort on WeinerGate. They were and are taking their eyes off the the real problems as detailed above and illustrated below in William Warren's political cartoon. By William Warren: "Today my cartoon looks at the debt crisis which is spreading from Europe to the U.S."
Tags: European Central Bank, France, Germany, Greece, Ireland, Italy, Political Cartoons, Portugal, Spain, U.S. Debt Crisis, William Warren, the economy, collapse of America, Anthony Weiner, US House, US Senate, White House, Cut, Cap, Balance, Bill Smith To share or post to your site, click on "Post Link". Please mention / link to America's Best Choice. Thanks! Posted by Bill Smith : Post Link --> 2:56 PM 0 Comments - Share Yours! NOTE: At the end of this article, is the following kinked article The truth behind Chrysler’s fake auto bailout pay back, by Conn Carroll for the Washington Examiner. Ever wonder who really payed back the US for the money loaned by the US to GM? Read the article - You are going to get very angry because YOU paid for the money to pay back for the loan that YOU (via the Obama Administration) gave to bailout GM. What a screwed up Country. Shaft me once, I am angry. Shaft me twice and I want to see heads roll even before the next election. By Christine Hall: Washington, DC, June 2, 2011 – Documents released last week by the U.S. Treasury Department indicate that General Motors and the Obama administration coordinated their PR strategy regarding GM’s much criticized 2010 ad campaign, in which the car maker misleadingly claimed to have repaid all its government loans. In May 2010, after GM’s campaign was launched, CEI filed a deceptive advertising complaint with the FTC, and GM shortly thereafter stopped running the ads. CEI also filed a Freedom of Information request with Treasury for documents on the ad campaign. Those documents were finally released last week, after nearly a year of delay. “One year ago, the US Treasury Department aided General Motors in its fraudulent claim that it fully repaid its government loans,” said Sam Kazman, CEI General Counsel. “The detailed nature of their cooperation is demonstrated in the Freedom of Information documents that the Department has finally produced. Rather than respond within the 20 day statutory time period, Treasury took nearly a year to release these documents. The documents produced as a result of CEI’s FOIA request show GM sharing PR strategy with the Obama administration more than three weeks before launching the campaign. The Treasury Department sent some of those documents on to the White House at least two weeks before the launch. The timing of the Treasury Department’s response to CEI’s FOIA request appears to be connected to the administration’s current flurry of activity to tout the alleged success of the auto bailout. The Treasury Department inexplicably took almost a full year to respond to CEI’s FOIA request. (See FOIA document pg. 1.) Yesterday, Treasury Secretary Timothy Geithner wrote a Washington Post op-ed on June 1, 2011 with a similarly misleading statement that Chrysler had repaid its government loans. Tomorrow, President Obama is scheduled to give a speech at a Chrysler plant in Toledo, Ohio, likely trumpeting the auto bailout. Treasury Secretary Geithner issued a press release touting GM’s repayment on the same day that GM launched its ad campaign. (See pgs. 9-10.) The newly released documents, however, indicate that the interrelationship between the Treasury Department, the White House, and GM on this PR effort was more extensive than previously realized. Once GM launched its campaign, it was widely ridiculed, and then, as revealed by the documents, Treasury officials began to develop a plan for responding to those criticisms. Tags: Christine Hall, Competitive Enterprise Institute, GM, Obama Administration, bailout, documents, relationship, payback, To share or post to your site, click on "Post Link". Please mention / link to America's Best Choice. Thanks! Posted by Bill Smith : Post Link --> 11:30 PM 0 Comments - Share Yours! Cut off the enemy’s flow of men, materials, and resources. Reduce the enemy’s sphere of influence. by Bethany S. Murphy, Heritage Foundation: This week Rep. Allen West (R-FL) addressed a packed crowd at The Heritage Foundation to discuss how the battlefield in the 21st century has necessitated a change in military strategy. The speech was the closing event for Protect America Month, an annual series of events highlighting the importance of funding our military. Watch West’s full speech below. Tags: Allen West, Florida, Representative. Retired Officer, US Army, Heritage Foundation, National Security and Defense, Protect America To share or post to your site, click on "Post Link". Please mention / link to America's Best Choice. Thanks! Posted by Bill Smith : Post Link --> 8:31 AM 0 Comments - Share Yours! Human Events: Weiner’s Mayoral Ambitions Twittering Away? Tags: A.F. Branco, political cartoon, Weiner Gate, Anthony Weiner, Twitter, photo, NY, Congressman To share or post to your site, click on "Post Link". Please mention / link to America's Best Choice. Thanks! Posted by Bill Smith : Post Link --> 8:14 PM 0 Comments - Share Yours!